Szym-nutriWH is a type of complex feed enzymes designed and formulated by our animal’s nutritionists and microbiologists for wheat daily diet, which is derived from the superior strains and produced through deep fermentation, purification and extraction. The numerous feeding trials have proved that this product is quite effective for wheat-type daily feed, and it is now being widely used. --Cellulase: 1 unit of acid cellulase equals to the amount of enzyme which hydrolyze CMC-Na to get 1μmol of reducing sugar (in glucose) in 1min. at 50℃ and pH 4.8. --Xylanase: 1 Xylanase unit (u) is defined as the amount of enzyme which liberates 1μmole xylose from 5mg/mL substrate solution (Oat Xylan) in 1 minute at 37°C and at pH 5.5. --β-Glucanase: 1 unit of β- Glucanase equals to the amount of enzyme which hydrolyze barley β-glucosan to get 1μmol of reducing sugar (in glucose) in 1min. at 50℃ and pH 4.8. --Pectinase: One unit (u) of Pectinase equals to the amount of enzyme, which hydrolyzes pectin to get 1 μg of reducing sugar (galacturonic acid) in 1 min. at 50°C and pH3.5. --Mannase: 1 unit (u) of mannase is defined as the amount of enzyme which liberates 1μmole reducing sugar per minute from 3mg/mL mannan at 37.0°C and at pH 5.5 under the condition of the test. It is usually used as an animal feed supplement in livestock and poultry. The product should be stirred thoroughly with feed upon using. 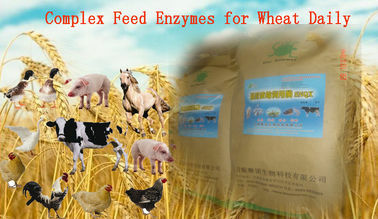 It should be pre-mixed with slight amount of feed, then mix with big quantity of feed, and feed directly. 100-200g/MT for complete feed. Increase dosage after shelf life. --Enhance immunity and the anti-heat stress capacity, reduce digestive system disease and nutrient metabolism disease. 15/20/25kgs/bag; Or package as per requirement. Minimum of 12 months from date of production when keep in a dry, well ventilated and cool place with packaging unopened.